On Your Mark Create! Hop | OccasionalPiece--Quilt! Posted on April 18, 2018 by Elizabeth E.
I was recently sent a stack of fabrics as I was asked to be a part of the On Your Mark Create! 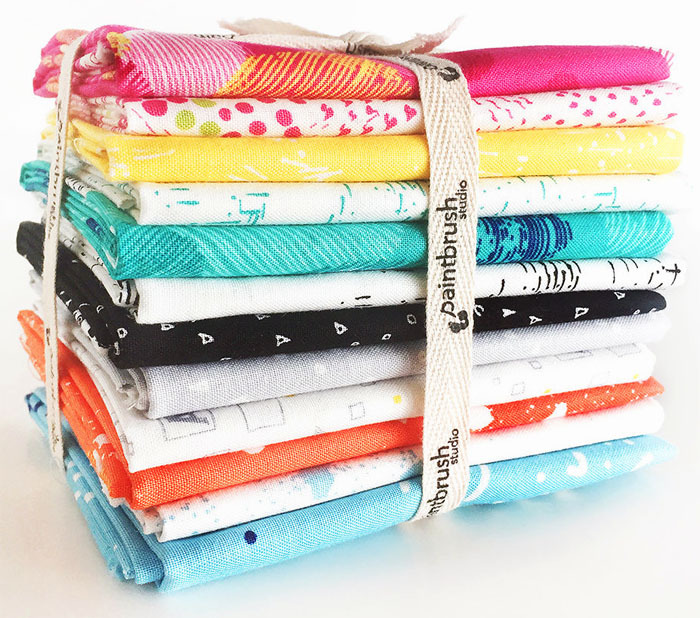 blog hop; I jumped at the chance to work more with my friend Simone’s On Your Mark fabrics. I stewed over what I could sew, since I’d already made a baby quilt. This time I wanted some quilty project that would be fun and helpful for me and for you. Yes, lunch, and when I looked those placemats on the table, I knew they were way past their Sell By date. It was time for some new ones. The fabric has a soft hand, and to make sure I didn’t have the placemats shrink out of shape (and, as a mostly-I-prewash-fabric quilter), I threw the fabrics into the washer, then dryer, until they were damp-dry and then pressed up the fabric. I had fun choosing which leaves to go where. I also made some changes to how the pattern went together. First I constructed the placemat completely, following her instructions for fusing and stitching. But then I layered the placemat on top of batting without quilting it down first. I layered the backing on top of that RST. I stitched around the edges, leaving an opening. I turned it inside out, and closed the opening by top-stitching around the outside edge of the placemat. It looks poofy, but it settles down when you quilt it, which is the next step. After stitching around the outside edge, I’d say to do it again, 1/4″ away. Then quilt the plain spaces in the mat. I went around the leaves first, then stitched more leaves in a random fill pattern all over. Did I mention they are reversible? I know a lot of folks don’t set proper tables anymore, but there’s something so lovely about a well-set table that shows love to all who join in. After using them for a few days, I think I should have places the leaves on the RIGHT side of the placemat, for then the glass would be like the flower at the top of the leafy stem. Next time. PS. That’s my grandmother’s napkin ring you see up there. Here are my On Your Mark placemats, gracing our table for dinner. By the way, one night we spilled on them, and I tossed them in the washer then laid them out flat on top of the dryer to dry, and they look as good as new. No shrinking. UPDATE: Giveaway closed now. Thank you all!